In 2015, I introduced some Starfish Bay Children’s Books. Today I’d like to tell you about some more Starfish Bay books. The company’s books are distributed in Australia, NZ, the US and Canada. To be published in June 2017, The Roadman Boogie by Nikki Slade Robinson is a hardcover children’s picture book. The Roadman Boogie is a delightful and true story of a bored Roadman who found a way to entertain himself with dance on a wet and blustery day. The Roadman has some great dance moves and his happiness and enthusiasm is infectious as he jumps around listening to the various beats blaring from car to car. Children will be enthralled as they see him dancing the rhumba and salsa, wiggling his bottom to a tune, and finding a way to keep drivers happy in a soggy situation. The gorgeous rhyming text is also a joy to read! I love the fact that this rhyming children’s picture book is based on a true story! The idea of a real road worker being so full of joie de vivre that he had to dance while directing traffic just makes me smile. Kids will smile too as they read “A bouncing boogie-woogie Made his bottom all a-wiggle.” and “A snazzy bit of Jazz got him jiving with pizzazz…” Robinson’ s illustrations are exuberant and active, showing the roadman executing his moves with panache, all while clutching his Stop/Go sign. A Dog Like That is a soft cover children’s picture book, by Janene Cooper, illustrated by Evie Kemp, and published in May 2016. This is a delightfully warm story about a little girl and her best friend: an unruly, yet loyal and lovable, little dog. Everybody tells her how dogs should be, but this girl knows better. Her dog does what he likes, which just so happens to fit perfectly with his owner. A Dog like That! 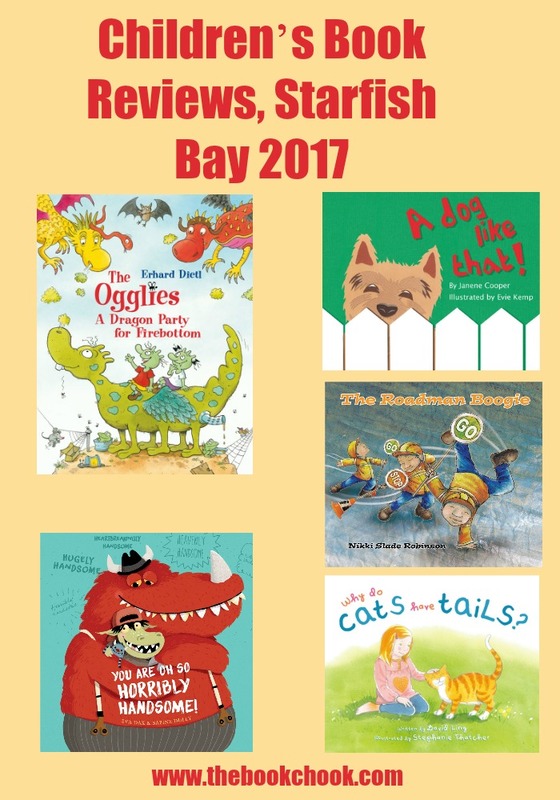 was a finalist in the New Zealand Post Children’s Book Awards. It also won a Storylines Notable Book Award and was a LIANZA Russell Clark Award Finalist. You can’t help but be impressed by the young narrator of this book. Despite being told by everybody how dogs are supposed to be, she is steadfast in her appreciation of her own dog. A dog that is more likely to lick strangers than bark at them, but can be relied upon to love its owner and comfort her in time of need. The text is very simple with a believable child “voice”, and Kemp’s simple, brightly coloured illustrations complement it perfectly. A Dog Like That would make a wonderful model to use with children keen to write about their own pets. The Ogglies: A Dragon Party for Firebottom by Erhard Dietl, translated by David-Henry Wilson, published May (2016.) A hardcover book. The Ogglies: A Dragon Party for Firebottom is a gorgeous picture book that tells the story of the Oggly children and their beloved dragon pet, Firebottom. The Ogglies are interesting characters with green skin, lumpy noses and tough teeth; they eat rusty cans, love sticky soup and are sure to give children a good laugh. The Ogglies are very worried about their dragon, Firebottom, and decide to throw him a birthday party to cheer him up. The story is delightfully silly; the Ogglies have positively crazy ideas and everything gross is, in fact, good. Children and adults alike will laugh as they see all the pictures and hear all the nonsense words and phrases used. Whatever culture kids come from, I just know they will relish reading about green creatures with lumpy noses that adore the smelliest pongs and who fly around on their pet dragon, Firebottom. There is stinky stuff a-plenty is this humorous story about how the Ogglies set about curing their pet’s depression. The Ogglies themselves remind me a bit of The Bottersnikes, only they are much nicer in character. This is not the classic picture book format that we are used to seeing in Australia, but is a longer, more detailed story, richly illustrated with very detailed comic-style drawings. There’s a happy ending, and even a Birthday Song (and music score) for Firebottom. Wilson has done a fine job of translating to English from the original German. This is certainly a worthy addition to your collection of picture books for slightly older kids to read for themselves, say 7 - 9. You are oh so horribly handsome! by Eva Dax, illustrated by Sabine Dully, translated by David-Henry Wilson, published September (2016.) A hardcover book. Here’s another children’s picture book by a German author and illustrator. It’s about a most unappealing monster called Gregor, who seeks reassurance from his friends and family. Kids will love the vocabulary with lots of “disgusting”, “stinky” “yucky” etc, amply borne out by Dully’s graphic art showing close-ups of microbes and germs on Gregor’s skin. (Anyone who has read Kafka’s Metamorphosis will not wonder over the name Gregor being chosen!) There’s a truly heart-warming lesson that the little monster learns, making this a great choice as a read-aloud for Hallowe’en or anytime. Children can come up with some pretty funny questions! Here in this warm and amusing story, Grandpa teases his granddaughters with some very unusual answers. The girls are spending time with Grandpa and his cats, and reject all his silly answers, until one of them comes up with an idea that even Grandpa could not think of. This is a story that amuses and entertains grandparents and grandchildren alike. This is a gentle children’s picture book that young kids will enjoy and relate to. I really valued the relationship between Grandpa and the young girls, one that I’ll bet is mirrored all over the world. Grandpa has such silly suggestions, despite his straight face, and the older girl loves to correct him. “Grandpa, why do cats have tails?” “Hmm. Maybe so that they can swing through trees.” “No Grandpa, monkeys swing through trees.” Thatcher’s illustrations use soft watercolour to add to the humour of Grandpa’s creative scenarios. A sweet story to add to your collection of picture books about family.